Today was the big day. I showered, shaved, pulled on fresh underwear and dressed in the most conservative manner. Whirred off to the plaza there in front of the Federal Building, and sure enough, as i approached saw a line of vans labeled “National Police”. Hmmm, when did we get our National Police? Somehow as we swirl down into totalitarianism it had escaped my notice that we now have our own Gestapo in addition to all our other layers of law enforcement. And just this morning, in case i was even thinking about any potential civil disobedience, i read in the paper about how Big Sister herself, our own Senator Feinstein, reiterated her longtime support for closely monitoring the words and deeds of all 300 million of us potential malefactors and troublemakers so that an immediate stop might be put to any dissent. So what was the demonstration like? 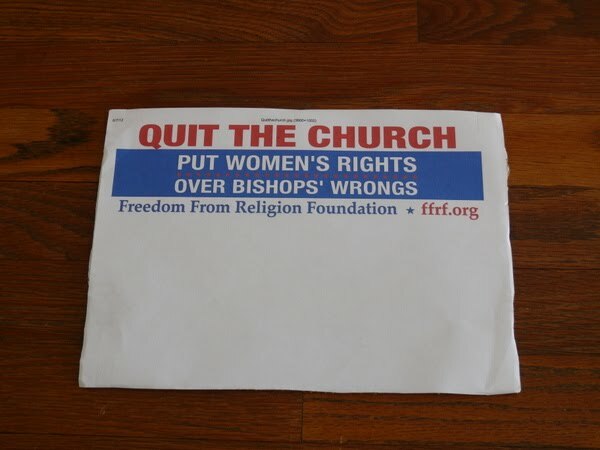 Well, about a hundred Roman Catholic fanatics were gathered, all holding 1’x2′ glossy blue posters of which the organizers must have printed thousands, as men were circulating constantly offering them to anyone who wasn’t waving one. And right on time, the MC mounted the stage and started alternating prayers and carefully selected quotations from our founding fathers, references to the bill of rights, lines from the Declaration of Independence, and criticism of Satan’s handmaiden, Barack Obama. I finally got so bored that i left. But what about the counter-demonstrators? You ask. 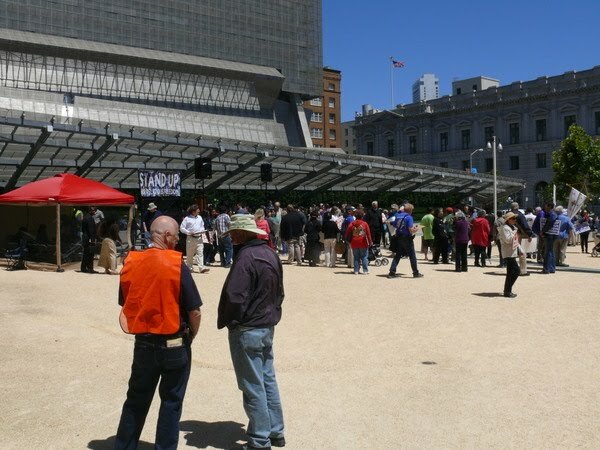 Well, in a city of 800,000 the event drew less than a hundred demonstrators, so i suppose i should just be gratified over that pitiful showing and not be surprised that as best i could determine the total number of counter-demonstrators was one. Me. Sitting there holding my little 9″x12″ sign. I have to admit that there’s been a great deal of improvement the past few centuries. I was not set upon and torn to pieces, i was not stoned to death, i was not burned at the stake, i was not stretched on the rack until a miraculous visitation from God stimulated my conversion to Catholicism. I was studiously ignored. I sat there with my sign for ten minutes before the program started and for the interminable first twenty minutes of the festivities, and not a single person said a word to me. Just flicked their eyes away as soon as they read my sign. Well, yes, i figure they were thinking that while i didn’t look dangerous, i was clearly deranged and was probably wearing a suicide vest under that bulky coat or at least packing.